Nestled in the heart of wine country, Firestone Walker is at once a quintessential west coast IPA brewer, and a mecca for Europeanstyle barrel-aged ales. Nestled in the heart of wine country, Firestone Walker is at once a quintessential west coast IPA brewer, and a mecca for Europeanstyle barrel-aged ales. We resolve to find out more from brewmaster Matt Brynildson. The sun is merciless on the drive down to Paso Robles and Firestone Walker. Everything is the colour of dust and my delicate British metabolism is feeling the pressure. Fraser’s taking his turn at the wheel, so I crack open a bottle of kombucha that’s been sitting in the door pocket overnight, hoping it won’t be too unpleasant to drink warm. Naturally, it explodes in a geyser of over-eager secondary fermentation, dousing me, the car and even Fraser with sticky, vinegary peach tea. Brilliant. Firestone Walker is just off the Interstate and head brewer Matt Brynildson is there to greet us with a cool drink and (in my case) some privacy to execute a complete change of clothes. Matt grew up in Minnesota in the upper Midwest. With a strong Norwegian and German heritage, this was prime beer country with plenty of small regional brewers, even before the start of the craft movement as we’d recognize it today. He didn’t grow up with a particular passion to be a brewer though; that didn’t come until later, when he moved to Kalamazoo, Michigan for college. Kalamazoo is also the home of Bells, the first microbrewery to open east of the Rocky Mountains in the early 1980s. Having been a keen homebrewer (and still owning a home brew store) founder Larry Bell befriended the young Matt, teaching him the craft and introducing him to the brewery team. 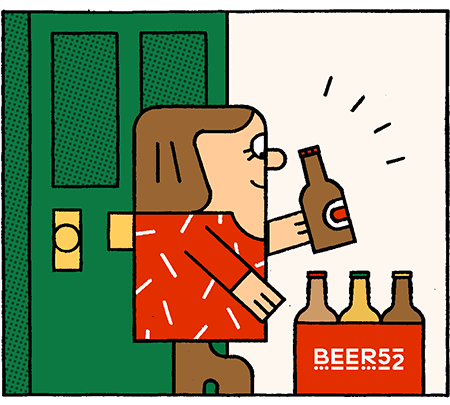 While he spent his days learning the complex chemistry of hops and brewing, his spare time was spent creating beers at home, and his career ambitions began to crystalise. After completing the course, Matt secured a job in Chicago, brewing for Goose Island, where he stayed for five years, eventually rising to head brewer. Matt eventually left Goose Island in 2000, in search of sunny California, and took a job at SLO Brewing Company in Paso Robles, founded 1998. One year later, he was appointed brewmaster, but not long afterward the brewery went into receivership (“I don’t think it was my fault!” says Matt). At the same time though, Firestone Walker – whose flagship Double Barrel Ale (DBA) barrel-aged pale ale was already a regional classic – was looking to expand. Brothers-in-law Adam Firestone and British ex-pat David Walker (represented by the bear and the lion respectively on the brewery’s logo) established their brewery in Santa Barbara County in 1996. Seeing both a ready-made expansion and, in Matt, the creativity and expertise to move Firestone Walker beyond its success with DBA, Firestone Walker bought out SLO Brewing Company. “Adam and David bought the brewery and myself, along with Jim Crooks who heads up our Barrelworks programme, in 2001,” continues Matt. “At that time Firestone was making 9000 barrels of beer a year. Last year I think we made 365,000 barrels, in a brewery that wasn’t built to do more than 60,000. But it wasn’t just the extra capacity that Adam and David were looking for. Since joining SLO Brewing, Matt had really pushed more of the racy west-coast dry-hopped beers that the region was becoming famous for, and he continued to fly this flag under Firestone Walker. “Quite rightly, David in particular was adamant about doing a small number of things very well, so it wasn’t until nearly 10 years later, in 2006, that we came out with Union Jack IPA. At that time, the pendulum had swung toward high-abv, double dry hopped IPA, and that’s what Union Jack was so it did really well. We’ve launched a couple more since then: a session IPA with Easy Jack to cover lower alcohol, Double Jack which is a big double IPA and Luponic Distortion, which is one of our fastest growing beers right now. One of the most interesting parts of the Firestone Walker story is the brewery’s relationship with California’s wine industry, in whose midst Paso Robles sits. Adam Firestone is himself a third-generation wine grower, whose family started as viticulturists, and then later opening a winery of their own. “The wine background was so helpful,” recalls Matt. “Adam’s family had been in the industry so long they understood distribution, as well as production. Not just the mechanics of it either, but the huge cultural part. Adam is a brilliant businessman, in good times and bad; he has a knack of looking over the prow of the ship and seeing what’s coming. And David is this genius people person; he’s so good at getting teams to work together. They’re a perfect combo. For Matt as a brewer, coming to wine country and taking on a lot of that culture was a bit of an eye-opener and challenged his assumptions. For example, there are a host of beers in Firestone Walker's portfolio that are blended, including DBA and Pale 31. He also works closely with local vineyards on acquiring their spent barrels, using their wine microflora to create interesting beers as part of the brewery’s Barrelworks programme. “Just yesterday, we were brewing a beer with Thatcher winery that we’re going to finish down at Barrelworks. And then, come harvest when he presses off his grapes, delivers all the skins to us with all of the yeast from that press, and we rack the beer on top of it. The beer turns deep purple and the yeast just blasts off and finishes the fermentation – it’s crazy. There’s a lot of these cool opportunities because we’re in the community. We like to think the beers we’ve made in this wine region couldn’t be made anywhere else in the world. Kind of like how lambic can only be made in one region of Belgium." The beers we’ve made in this wine region couldn’t be made anywhere else in the world. Matt talks a lot about the similarities between craft brewers and the small wineries, particularly in terms of the sense of community and personal relationships. Despite IPAs becoming an evermore commercially important part of Firestone Walker’s portfolio, it’s clear that barrels remain at the core of what the brewery is about. As well as barrel fermenting DBA since day one, it has a full Burton Union system and the Barrelworks programme has, in Matt’s words, “taken on a life of its own”. In 2015, Firestone Walker sold a majority stake to Belgium's Duvel Moortgat – a career-long hero of Matt’s – giving the team access to new expertise and materials. There has already been collaboration between Firestone and Duvel’s breweries, including a barrel exchange with the brewmaster at Liefmans, the first results of which are just reaching fruition. “Part of the reason we partnered with Duvel was it’s a 150yo brewery; if they can have that kind of game plan, they have to be good people to work with,” explains Matt. “I mean, people are going to be drinking beer for centuries to come, and we’ve been doing it since we stood on two legs. Whether this brewery will still be standing a couple of centuries depends on whether we can tread that line, where we’re not distracted by trends but are able to innovate and carve our own niche.